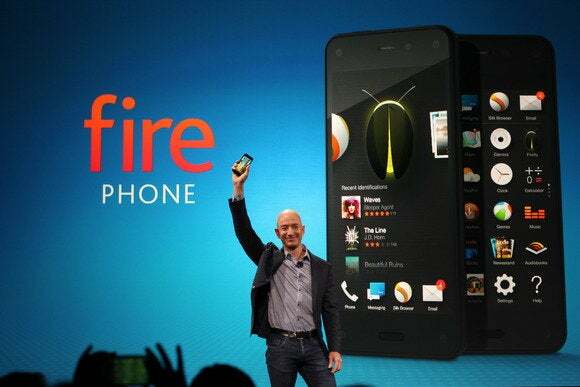 Amazon Fire Phone apps: How does Fire OS compare to Android? Amazon’s flagship Fire Phone certainly grabbed our attention this week. With its innovative Dynamic Perspective display, a bevvy of built-in Amazon features for devouring content, and some customer service features unheard of in other phones, Amazon’s first dive into the smartphone marketplace is off to a booming start. 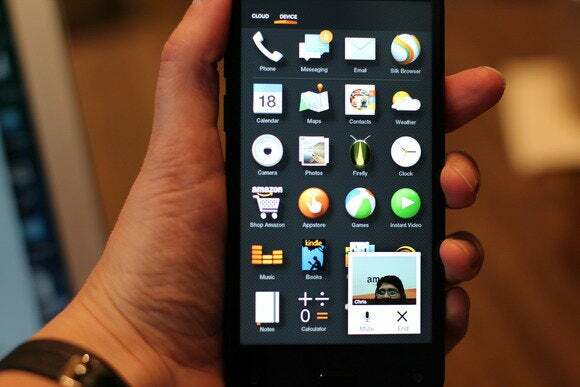 The focus of the event was on the Fire Phone’s hardware, specs, and built-in features, yet little was mentioned about Fire OS, the phone’s mobile operating system also found in Amazon Kindle tablets. If you’re not super familiar with Fire OS (hey, I’m not either—I don’t own a Kindle Fire, so I’ve spent very little time with it), here are a couple of things you need to know about the operating system and its apps. What the heck is Fire OS? Fire OS is technically a version of Android, but completely in Amazon’s own style. It’s a forked version, with Amazon’s own overlay, unique features you won’t find in stock Android, and its core apps are all Amazon’s own. As Susie Ochs noted in her hands on with the Fire Phone, it looks and feels like a brand new beast—because it is. Forking Android let Amazon add its own touches, like the Mayday feature in the bottom-right, which offers you live help. But it also means no Google apps. Amazon’s Kindle Fire tablet is also powered by Fire OS, but a slightly older version, Fire OS 3.0 “Mojito.” The Fire Phone runs Fire OS 3.5.0, which adds in support for the Fire Phone's Dynamic Perspective feature. One drawback of Fire OS right now is its lack of support for Bluetooth LE, aka Bluetooth 4.0. 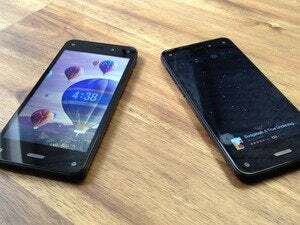 The Fire Phone only runs Bluetooth 3.0 at launch, although Amazon assured TechHive that the hardware itself is Bluetooth LE capable, and the company is working to upgrade the OS to support it. But right now wearables and other gadgets that sync to a phone with Bluetooth LE won't work with the Fire Phone. The Maps app (with data by Nokia Here) shows you Yelp listings when you tilt the Fire Phone. But haven't we been burned by brand-new Maps apps before? According to Susie, these apps have some catching up to do with its stock counterparts found in iOS and Android. The Maps app, for example, gets its data from Nokia, and seems a bit on the fledgling side when compared to Google Maps and even Apple’s Maps (which, two years after launch, still suffers). It could be a hard sell for users who heavily rely on maps. Hey, where are all my apps? The biggest bummer about Fire OS is that its Amazon Appstore isn’t nearly as full as iOS’s App Store and Android’s Google Play Store, with around 240,000 apps compared to more than 1 million in the other markets. Even though it runs an Android version of sorts, not every Android app is compatible with the Fire Phone. 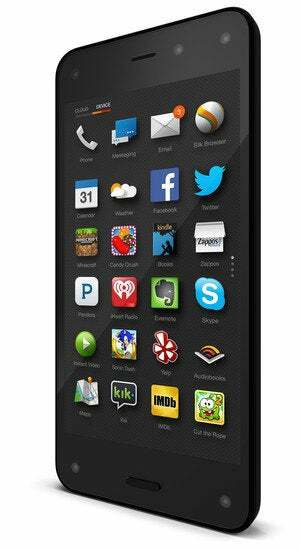 Amazon hopes to get all the must-have apps you'd expect on your smartphone by the Fire Phone's launch. The good news is that you’ll find many of your favorite apps ready to go, including Facebook, Twitter, and Vine on the social side; streaming entertainment from Pandora, iHeartRadio, HBO Go, Netflix, and Hulu Plus; communication apps like Skype and Kik Messenger; and other popular choices like Candy Crush Saga, Mint, Evernote, Dropbox, Pocket, StubHub, and HotelTonight. It appears as though updates for many of these apps are in the works, so hopefully they’ll be optimized for the Fire Phone when it launches on July 25. While Fire OS has many of the basics, there are still quite a few things missing, most notably the Google apps that both Android and iOS users have come to depend on. That means no Gmail, Chrome, Maps, or Drive, though Amazon has its own versions of each. Amazon promises that more third-party apps are in development for Fire OS. The company on Wednesday released SDKs for both Dynamic Perspective and Firefly, so developers can integrate those marquis Fire Phone features into their apps—Jeff Bezos demonstrated on stage, for example, how using Firefly to identify a song could result in deep links to iHeartRadio (to start a new station based on that song) and StubHub (to search for concert tickets). 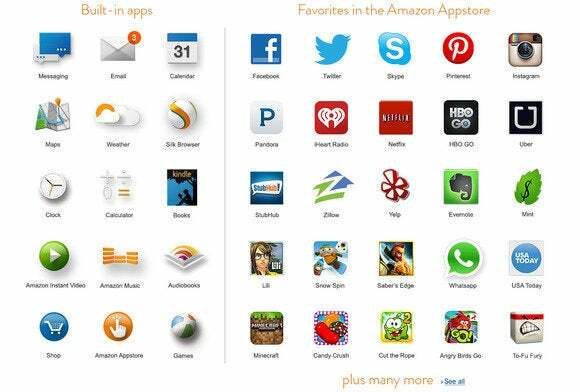 Amazon also said on Wednesday that apps submitted by July 18 will make it into the Appstore for the July 25 launch. We won't know what will make the cut until then, but we'll be sure to take each of these apps for a test run.